The colourful German poster for The Deceivers (above left) suggests exotic excitements with a hint of romance; the Anglo-American poster unwisely focuses on the movie's star and emphasises its theme of dual identity and temptation. The Deceivers is an oddity. It is an action movie, about a violent cult, set in India, made by a director most notable for his work on the Star Trek movie series and produced by the Merchant-Ivory team, famous for their genteel, tasteful and upscale productions of movies, many based on literary classics or historical figures: Room With a View, The Bostonians, Howards End and Jefferson in Paris. The pair's films were also distinguished by their glossy production values, especially costuming, photography and sets and stunning locations. The plot, an old-fashioned adventure yarn set in India in 1825, concerns an English officer Captain William Savage, who is appalled by evidence of Thuggee ["Deceivers"] mass killings and by the ineptness of official attempts to expose and destroy the cult. Savage, in both John Masters' book and the movie ,is based on a fascinating real-life Englishman, William Sleeman. (see below). Assisted by a former Thuggee, Savage infiltrates the group, becoming a Deceiver himself. He becomes increasingly fascinated by the bloodthirsty ways and occult ceremonies of the group. His personal identity becomes conflicted and overtaken by other values and influences. Slowly he descends into madness. In attempting to impose western societal and cultural values on Indians, he has become overtaken by different values. 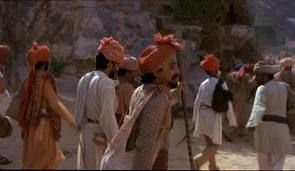 Pierce Brosnan as captain Savage in brownface with Saeed Jaffrey as Hussein, who helps Savage infiltrate a Thuggee gang. One of the more interesting features of the movie is its portrayal of the Indian countryside: arid and bleak rather than tropical. Superb costumes, lavish sets and fine photography were features of Merchant-Ivory productions - "The Deceivers" did not disappoint in this aspect. Critics agreed that The Deceivers' photography (Walter Lassally) and sets (Ken Adam) were outstanding. But critical reception overall was largely negative. Critics noted the major problem was that the film tried to conflate two irreconciliable elements. On one level it tried to be a swashbuckling adventure story set in an exotic locale. Yet it also tried to be a thoughtful examination of the nature of imperialism and the issue of conflicting cultural identities. For most critics, the film fails on both levels. It was also condemned for the blatant implausibility (and racist connotations) of its plot: an Englishmen being able to deceive bloodthirsty, cunning Indian Thuggees by concealing his white skin for months beneath a layer of brown polish. Yet some praised the film for its depiction of the influence of another culture on westerners, and for Brosnan's depiction of Savage's inner turmoil. The movie's pleasingly ambiguous conclusion was also praised. The lush photography and elaborate costumes and settings found favour with many critics. However, The Deceivers failed at the box-office. 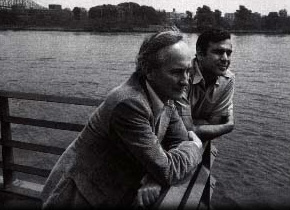 This movie was the brainchild of Ismail Merchant, the financial and production genius who worked with his professional and personal partner, the American director James Ivory, to become one of the most potent film-making forces of the period form the 1970s to the 1990s. Merchant was the impulsive, flamboyant showman who made curries and afternoon tea for cast and crew; Ivory the reserved artist. Both men shared a fascination with two themes that recur in their movies - and which can also be seen even in The Deceivers. Most of their films are about cultural conflict, especially in societies or settings which are under pressure from new sets of values. Intertwined with theme is that of the struggle of individuals whose ideals or beliefs are under threat or in conflict. At its best, as in The Remains of the Day, these themes are examined with moving intensity. Although both frequently worked with scriptwriter Ruth Prawer Jhabvala, she did not write The Deceivers screenplay.The movie, released under the Merchant-Ivory imprimatur, was the first movie the pair made that was not directed by Ivory. 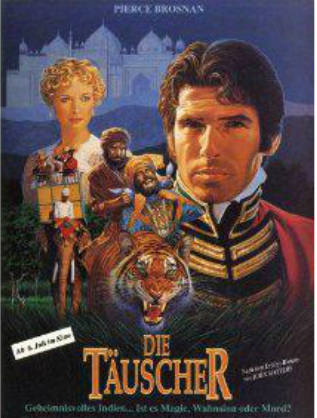 For years Merchant had wanted to make a movie out of John Masters' atmospheric novel about the British attempt to destroy the thuggee cult in India in the 1820s. (Hammer Studios had previously used the novel's plot as the basis of 1959 movie, Stranglers of Bombay). Merchant's early films usually looked at the impact of British rule on Indians and the impact of India and its culture on the British themselves. So The Deceivers fitted within this template. Ivory, left, and Merchant, right, on location, late 1970s. But Merchant had great trouble making the film. He faced difficulties raising the finance, finding a director and getting the requisite actor for the lead role. (Eventually he used Pierce Brosnan, then in his pre-Bond days). For the director, Merchant made the interesting decision to hire Nicholas Meyer, who had recently made Star Trek II: Wrath of Khan - the best of all the Star Trek movies. Meyer had previously done a good job of directing his own Sherlock Holmes novel The Seven Per-cent Solution and he had also made an excellent time-travel movie Time After Time. 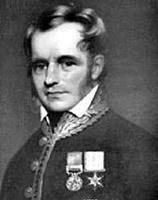 The model for John Savage, the hero of John Masters' novel The Deceivers and of the movie, was William Sleeman, (1788 - 1856) a soldier in the Bengal Army and then a top-ranking civil servant in British India. This mild-looking man was not only an admirer of the countryside of India; he was also the first person to discover dinosaur fossils on the sub-continent. His chief claim to fame was his campaign against Thuggees in India. As in the movie, Sleeman persuaded one of Thuggees to change sides and take him to sites of atrocities and identify ringleaders. He used this evidence to persuade previously sceptical British authorities to place him at the head of a campaign to eradicate the group. Sleeman never infiltrated the Thuggees as in the movie; his chief tactic was to use informers and protect them from their former comrades by placing them in a special prison. Notions of a brutal and bizarre cult in an exotic setting proved irresistible to the British and American public at the time. In 1830 an English author Philip Meadows Taylor wrote a best selling novel called Confessions of a Thug, which introduced the term 'thug' to the English language.